Check it out. We've added a new photo viewer to the site. Click on "More photos!" to launch it. This first bunch of photos is from our trip to the Eden Project in Cornwall in the west of England. It's got a series of cool domes with different ecosystems inside. Check it out: they really put a lot into explaining how plants and people are connected. We saw plants growing and learned about why we need them. There's also amazing art — take a look at the giant scrap metal statue in the photo viewer. Freaky! 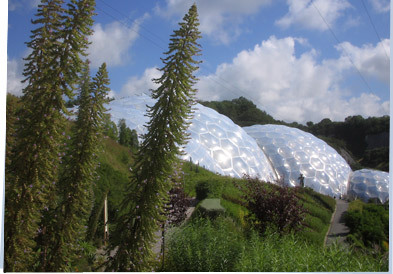 You can find out more about the Eden Project at their site.